This document shows how TAS Systems can comply with the rated performance of desiccant-based dehumidification systems, as documented by Trane in the Engineering Newsletter volume 34-4. 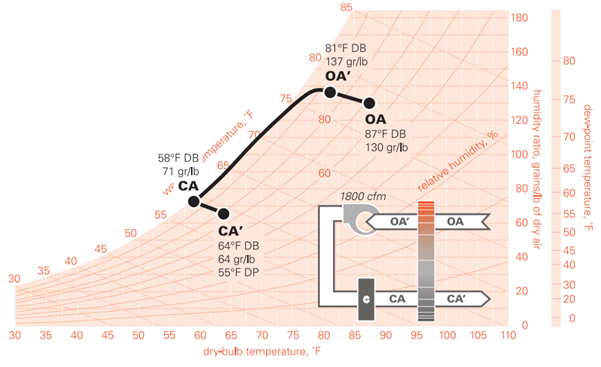 Each different arrangement of desiccant wheel has been modelled in TAS Systems to match the performance of the Trane examples shown via psychometric charts. These have been closely reproduced in TAS. 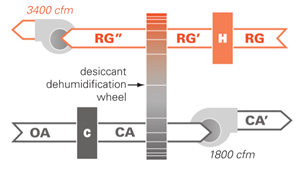 Traditional desiccant dehumidification wheels in a parallel arrangement rotate between two air streams. The regeneration air stream (RG) may be a building exhaust that is used exclusively to reactivate the desiccant. 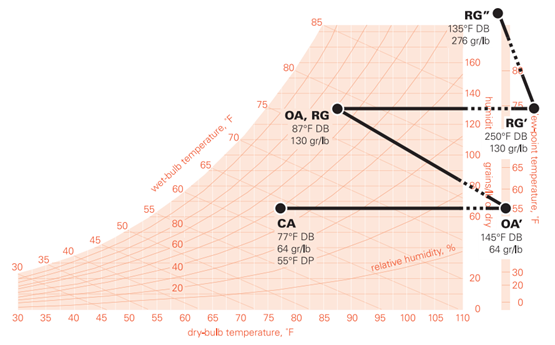 The RG is heated in order to raise the dry bulb temperature and, in turn, lower the relative humidity. This results in water vapour being transferred from the OA stream to the RG’ stream. Although the desiccant wheel removes latent heat (moisture) from the process air stream, sensible heat is added. A cooling coil is often required downstream of the desiccant to cool the air to a practical and usable temperature. Generally speaking, most desiccants adsorb more water vapour as the relative humidity of the process air rises. 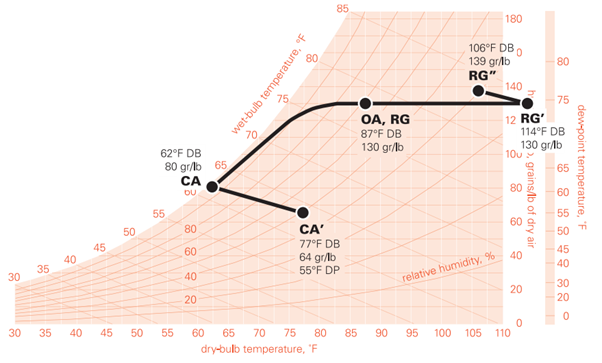 Desiccants also adsorb more water as the dry bulb temperature of the process air falls. 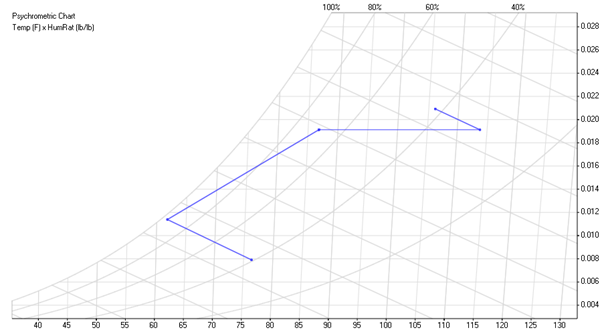 During the cooling season, the coldest part of the system is that which is directly downstream of the cooling coil. It is for this reason that it would be desirable to place the desiccant wheel downstream of the cooling coil, rather than upstream, as in the previous example. 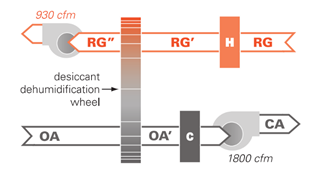 This wheel downstream configuration is mainly used in dedicated outdoor air applications. 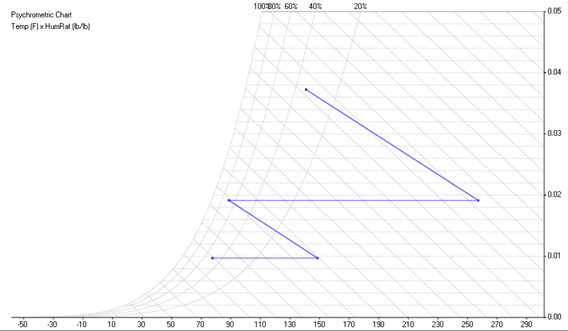 Relative to the wheel upstream arrangement as used previously, the same dehumidification can be achieved to the same dew point but less or no recooling is required. Series regeneration in a desiccant system places the regeneration side of the wheel upstream of the cooling coil and the process side downstream of the coil. Moisture is adsorbed from the process air downstream of the cooling coil and is placed back upstream of the coil. This negates the need for a separate regeneration air stream. Air leaving the process side of a series desiccant wheel is cooler that the space, making this kind of system good for use in a mixed air stream, with one unit being able to cool and dehumidify the air. 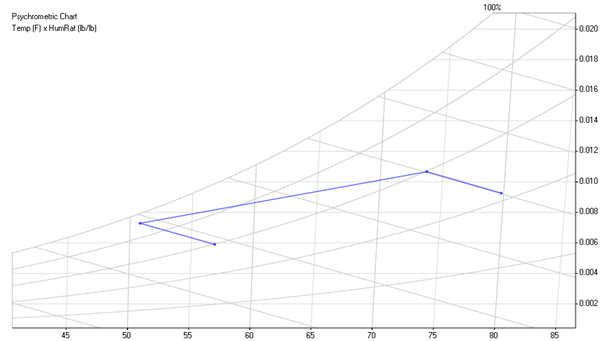 Results slightly swayed so that the output is closer rather than the mid system section that will not be used. A series desiccant wheel can also be used in a dedicated outdoor application because the wheel adds little sensible heat to the process air. 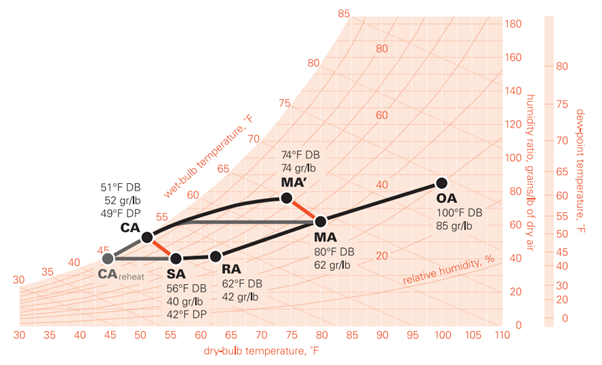 This means that the dry bulb temperature of the process air is cool enough to use. 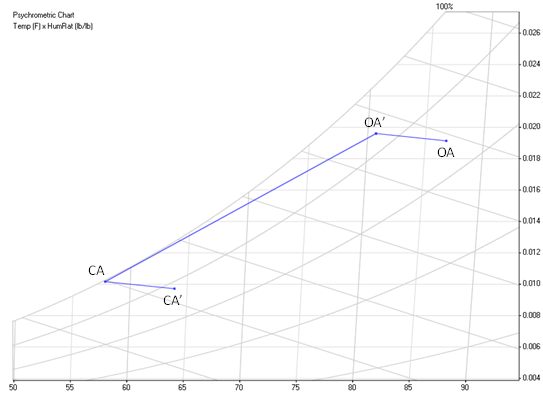 This application can be compared to the ‘Wheel downstream of cooling coil’ arrangement that was considered earlier. In the same conditions the series wheel delivers air at the same dryness but at a cooler temperature than the downstream wheel.